Please help us raise money for The Musella Foundation dedicated to brain cancer research and awareness. Four years ago my beautiful friend and running buddy, Christi Wetzel was diagnosed with an anaplastic astrocytoma brain tumor. After surgery, radiation and chemotherapy she is doing well today. 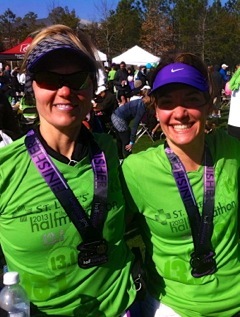 She completed her first half marathon last year and together we are currently training for and will run The Woodlands Marathon on March 1, 2014. The Musella Foundation For Brain Tumor Research & Information, Inc is a 501(c)3 non- profit public charity dedicated to speeding up the search for the cure of brain tumors and to help families deal with a brain tumor diagnosis. 100% of your tax deductible donation will go to this wonderful organization! When you make the donation below, we will already know it is In Honor of Christi Wetzel and we will send an acknowledgement of your gift to the family.